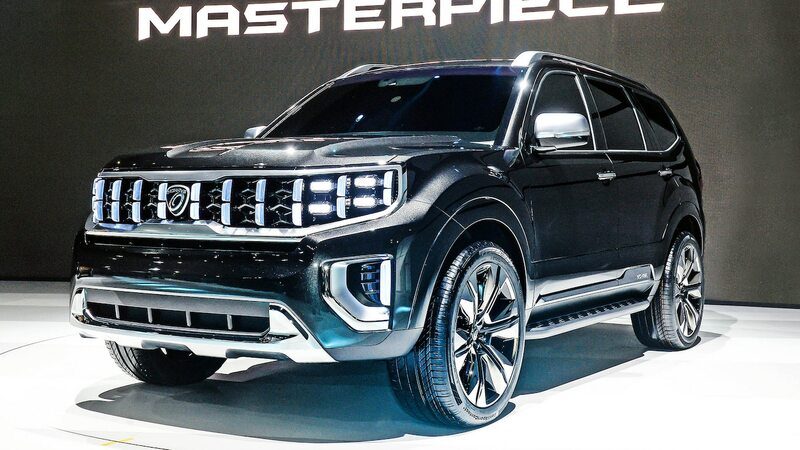 Kia just introduced a couple of SUV concepts at this year’s Seoul motor show; the larger one goes by the Mohave Masterpiece, while the much smaller one is called the ST Signature. The latter is the most significant, at least right now, because Kia may show the production version at next month’s New York auto show. The Kia Imagine, a cool electric concept we saw in Geneva earlier this month, also made its Asian debut in Seoul. The Masterpiece is an impressive-looking monster with a big, toothy grille flanked by quad LED headlights, and it looks poised to tackle the rockiest of trails. Equipped with all-wheel drive, Kia says it explores how a modern full-size off-roader—remember the old body-on-frame Kia Borrego (which was called Mohave in other markets)?—might use its current design language. The rear end features illuminated Mohave badging and quad exhaust tips. The SP Signature is sleeker in design, but the jury is still out on how it compares to the Hyundai Kona, the corporate cousin that the production version will share mechanicals with (That should give you an indication of its size, as well.) It sports wide, wing-like grille and headlamp graphics; a high beltline; roof rails; and an elegant if slightly anodyne rear with thin LED taillights split by a central chrome flourish. It will be interesting to see how much is toned down for the production version, although we may find that out soon enough.